Jeffrey Grossman, the Carl Richard Soderberg Associate Professor of Power Engineering in the Department of Materials Science and Engineering at MIT,Yosuke Kanai of Lawrence Livermore National Laboratory, Varadharajan Srinivasan of MIT’s Department of Materials Science and Engineering, and Steven Meier and Peter Vollhardt of the University of California, Berkeley are reporting they have mapped the behavior of a unique molecule to store and release heat – a kind of heat battery. This is an unrealized concept. There have been two approaches to capturing the sun’s energy: photovoltaics, which turn the sunlight into electricity, or solar-thermal systems, which concentrate the sun’s heat and use it to boil water to turn a turbine, or use the heat directly for hot water or home heating. Both offer storage by either a chemical battery or in heated materials. But heated materials inevitably lose the heat to radiation even in the best insulation systems. There is another approach the potential of which was seen decades ago, that was sidelined because nobody found a way to harness it in a practical and economical way. The approach is called thermo-chemical storage, in which solar energy is captured in the configuration of certain molecules, which can then release the energy on demand to produce usable heat. The heat-storing chemicals can remain stable for years. Starting in the 1970s researchers sought the molecules that would accomplish the task. Twenty-six years passed in the search for a chemical that could reliably and reversibly switch between two states, absorbing sunlight to go into one state and then releasing heat when it reverted to the first state. Such a compound was discovered in 1996. There is a major ‘but’ in this. The molecule included ruthenium, a very rare and expensive element, so it was impractical for widespread energy storage. Moreover, no one understood how the compound worked, which hindered efforts to find a cheaper variant. Grossman and his team think they have the chemical; called fulvalene diruthenium (FD) mapped so understanding the behavior and function. Their report on the work was published on Oct. 20 in the journal Angewandte Chemie. 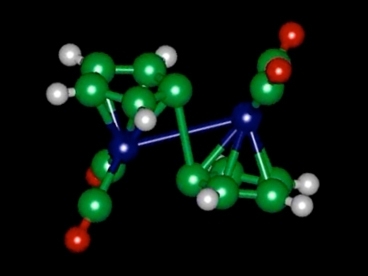 Fulvalene Diruthenium Molecule Diagram. Image Credit Jeffrey Grossman. Click image for the largest view. FD undergoes a structural transformation when it absorbs sunlight, putting the molecule into a higher-energy state where it can remain stable indefinitely. Then, triggered by a small addition of heat or a catalyst, it snaps back to its original shape, releasing heat in the process. But the team found that the process is a bit more complicated than that. Grossman explains, “It turns out there’s an intermediate step that plays a major role,” in this intermediate step, the molecule forms a semistable configuration partway between the two previously known states. “That was unexpected,” he said. The two-step process helps explain why the molecule is so stable, why the process is easily reversible and also why substituting other elements for ruthenium has not worked so far. There you have it, thermo-chemical storage at extremely high prices. Grossman is full of hope that much less costly molecules can be found. He said, “It’s my firm belief that as we understand what makes this material tick, we’ll find that there will be other materials” that will work the same way. The next step is to use a combination of simulation, chemical intuition, and databases of tens of millions of known molecules to look for other candidates that have structural similarities and might exhibit the same behavior. Something intuitive suggests to this writer those matters will resolve over time. Grossman plans to collaborate with MIT’s Daniel Nocera, the Henry Dreyfus Professor of Energy and Professor of Chemistry, to tackle such questions by applying the principles learned from this analysis in order to design new, inexpensive materials that exhibit this same reversible process. The tight coupling between computational materials design and experimental synthesis and validation, he said, should further accelerate the discovery of promising new candidate solar thermal fuels. A not hot, but heat holding form of storage offers the imagination a wide array of applications. Cheap enough, heat could be stored and moved over time without a continuous leaking away. That’s a revolution in and of itself. The obvious use is heat collection through the summer for use in the winter. A major reduction in thermal collection facility would occur. The impact would be very substantial. As basic research goes, this report must be 2010’s most significant achievement. Congratulations are in order for a discovery and exploration expedition now underway following a near 40-year wait. Interesting – a solar heat battery, instead of a solar electricity generator, or a simple solar heat absorber. Of course photosynthesis is a kind of solar battery, too, but one which stores chemical reactive potential. I see this solar heat battery in the article as exemplifying two separate potential technologies – First, it is a way of storing heat without insulation (other than protection from a catalytic heat-trigger to release the stored heat), which itself is revolutionary, even if the external energy source is not solar. And second, it suggests a redefinition of what a battery can be, since we now see an example of solar energy being used to “flip” a molecule into a higher-energy state. Hypothetically, the released energy of some other, analogous, molecule doesn’t need to be heat – it could just as well be a change in chemical properties, resulting (for example) in an electrical battery that is charged by the sun but requires no intervening transducers to tap a stored electrical potential. Pretty impressive post. I just came across your site and wanted to say I have really enjoyed reading your opinions. In whatever way I’ll be coming back and that I do hope you post again soon.